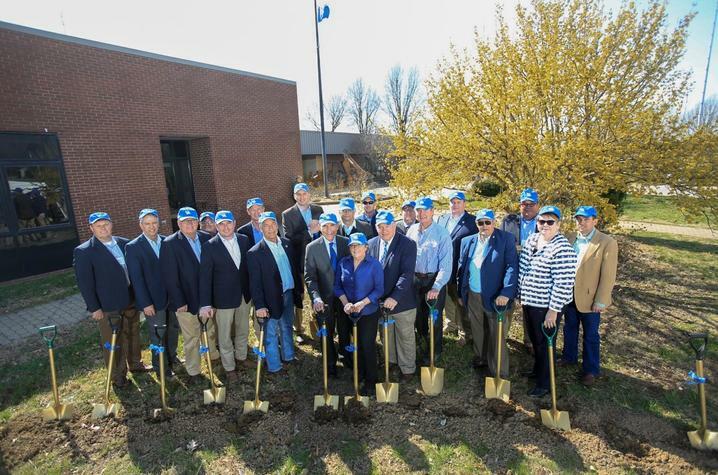 UK President Eli Capilouto and College of Agriculture, Food and Environment Dean Nancy Cox (center, front) and others break ground for the Grain and Forage Center of Excellence. Photo by Matt Barton, UK Agricultural Communications. Princeton, Ky. (March 16, 2018) – University of Kentucky researchers have a long, storied history of working with farmers and stakeholders to make the state’s agricultural community world leaders in innovation and adaption. Yesterday, they joined together to break ground on the Grain and Forage Center of Excellence, a facility that will allow them to continue this rich tradition.